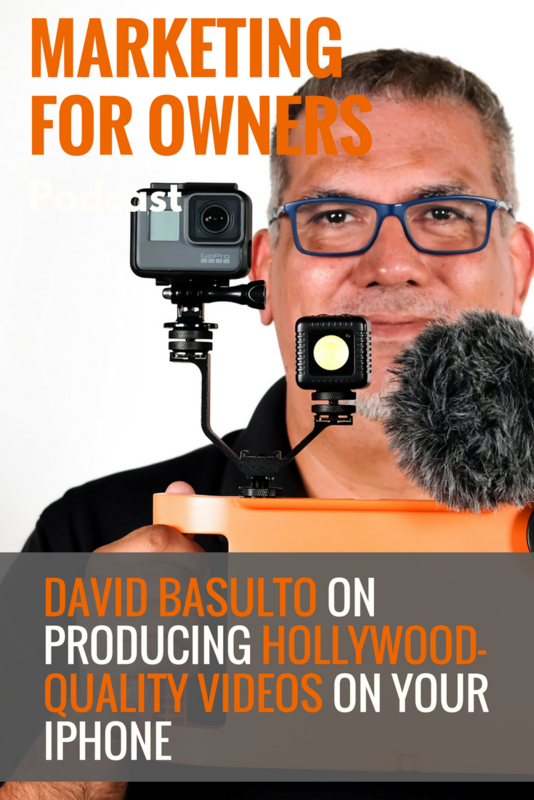 Before accidentally inventing the iOgrapher case which helps people to create professional standard videos using their mobile devices, David Basulto had achieved a lot. Leaving high school with a football scholarship, he went to San Diego State University in 1988 where he studied for his business degree. With a dream of wanting to be a Wall Street tycoon, he went to New York and got a job on the 63rd floor of the World Trade Centre. Whilst on a night out with friends, he was approached by a casting director to appear as an extra in the Rocky 5 film as a newspaper reporter. He fell in love with it, so moved back to LA and became an actor, and then a Hollywood producer. He achieved many things during this time and worked with some big names, but the industry burned him out. At home, he continued to direct, produce and edit films using his own camera and computer, until he was approached by a friend suggesting he taught kids at high school everything he knows. Becoming the most rewarding job, it is also his students who inspired him to create the iOgrapher case. And at the age of 51, he became an entrepreneur. He shares with us how he turned his accidental invention into a business, as well as letting us in on some filmmaking secrets so we can all start producing videos good enough for the big screen. It was an old friend who he’d not spoken to for years who offered him the opportunity to give something back and teach Media Arts and Animation, as well as journalism and field production. He instantly fell in love with it and he got his teaching credentials. And it was these students who inspired his next project. Teaching 130 students every day, having just five cameras between them all proved to be challenging. It either led to them working in large groups where many kids didn’t do very much or to work simply not being done. So he started to allow the students to use their iPhones and iPads, and suddenly they achieved a lot more work. On the flip side, they were producing videos which were shaky and afflicted by bad lighting and terrible audio. These issues drove him nuts. For storytelling, the devices prove great. But in order to produce videos which people would actually want to watch, they need to be of a higher standard. The need for tripods and microphones was obvious. That is when David set about designing something with handles which the kids could hold, and to which they could attach other equipment. He put together a prototype, had it 3D printed, and it actually worked. With that, he intended to simply have a few which the students could use to make their videos better. What actually happened, is with some encouragement from his students, turned it into a business. It was a pupil using it who suggested that David should put the item on Kickstarter. Once he’d looked up what it actually was, he decided to give it a go. It allowed him to test the market, and he thought that it may make him a few dollars. The next thing he knew, he was getting featured in Forbes magazine, The Wall Street Journal and The New York Times. He was the teacher trying to do good for his videographer students. With a Kickstarter goal of $15,000, he soon hit the mark. But it was afterward that he discovered just how much it would actually cost to produce and distribute the product. Along with a group of kids, he took the iOgrapher with him for their annual visit to Disney Studios, and it soon caught people’s attention. It was there that he met his business partner Tony who invested some money to turn it into a real business. He also found a pupil’s parent would be able to help with the injection molding production, and the products are made just 30 miles away from his home. David has the patent for a mobile case with handles in many countries around the world. The iOgrapher is more than just a protective case. When held by the handles, the videos are stabilized, and it can also be used to mount the device to a tripod. Onto it, you are also able to mount microphones and lighting equipment. When a case has a specific purpose, it doesn’t matter what size it is. And you’re not going to buy this case to discreetly keep your phone in your pocket after all. The iOgrapher is even used by professionals worldwide. Not only do the likes of the BBC and the Modern Family production team use it, but also sports teams like the Boston Celtics and the Miami Dolphin. Most notably, Steven Spielberg used one on the set of the Tom Hanks film Bridge of Spies. For David, there are some fundamentals you must consider when producing videos of your own. First of all, it is really important to stabilize the device in some way, whether that’s using the iOgrapher or another type of stand or mount. That way, the video isn’t shaky and won’t make the people watching it feel seasick. And at the very least, you should plug in the headphones which come with the phone. With a built-in microphone which you can talk into, the quality of the audio is drastically improved and far better than using nothing. You can also use professional microphones which plug in and are cheap to buy, such as the RODE smartLav. Lighting is also a simple thing which can improve your production values. Diva lights are available which clip on and provide a good standard of light. These are what many of the Vloggers are using. It also helps to not just stand in front of a boring background. Finding a good location to film provides a more interesting backdrop which looks better and can also be used to help tell your story. Plus by filming outside, you benefit from having natural light. These are all simple things which will help you to create a much better video, but you also need to be a good storyteller too. With live video, it is so easy for anyone to go online and speak to an audience. For it to actually be effective, you need to have a purpose and a story to share. You can check out Michael Hauge’s interview for great tips about storytelling. But just by doing the little things, people will see you’ve put in some effort, and you look far better than a majority of the videos which are available online. You’ll stand out from everyone else, and by comparison, look superior. There are always things to film in your business. You could answer customer questions, or you could show them how to use and get the most from the products you sell. On Instagram Stories, David shows people how to do things like changing the batteries. And each picture can have 2,000 clicks. And he also uses Facebook Live to answer questions and keep his customers in the loop. After all, it costs nothing besides time to make, and it may just be what someone needs to convince them to give your products or services a try. And you don’t have to be in the video yourself either, and instead, you could point the camera at the things you’re talking about. That can be particularly useful if showing someone what to do, or if you’re simply taking them for a walk about your store, warehouse or factory. You can even use video to humanize the business and introduce the real people who work there. As a result of doing this himself, David has a small group of superfans who he always finds watching his Facebook Live videos every week. The size of the audience you’re talking to isn’t important. Even if it has just 10 viewers, you don’t know who they are and what they might do as a result of watching the video. For their customers who have made a purchase, both Jon and David have a video which customers see once the order has been made. Customers can see they’re real people and it gives them the opportunity to be properly introduced. For David, he has received a lot of emails as a result, many of which are asking him questions. Over time, he found himself asking the same questions again and again, and that is what inspired him to write his book. In his book, Life Camera Action, David helps you to turn your mobile device into a filmmaking powerhouse. He shares his story, gives recommendations for devices, equipment, and apps, and will provide you with inspiration on what types of video you could start producing. And for people who have purchased the book, there is a private Facebook group in which he continues to help you, provide further recommendations and to answer your questions. To find out more information about David, you can visit his website where you can also read his blog posts. And by going to the iOgrapher website you can discover more about it and purchase one for yourself.